At Centro de Dia, a center run by local nonprofit Fundacion IPNA, people gather in a dining hall. The day has just started, and breakfast is being served. Daniel Verdura, 40, digs into his meal. 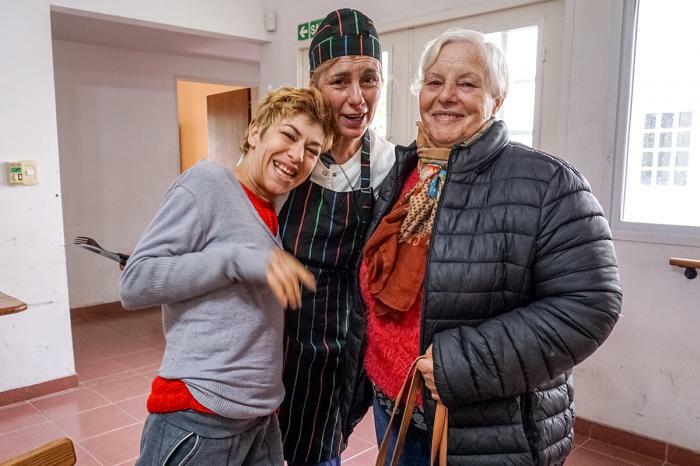 BUENOS AIRES PROVINCE, ARGENTINA --" The center offers recreational activities and professional-development opportunities to people with intellectual disabilities. Verdura has been coming to the center for four years. According to a 1997 law, the state must guarantee medical assistance, medication, special education, center-based care, and transportation, among other provisions, to people with disabilities who don't have health insurance. Programa Federal Incluir Salud is the public health-insurance scheme that makes it possible for Verdura to visit Centro de Dia. Without it, he would have to pay nearly 24,700 Argentine pesos ($885), the monthly fee for coming to the center. Until some months ago, 85 percent of those coming to the center relied on the state to fund their visits, says Jorge Goldman, Fundacion IPNA director. But the state has not paid monthly fees on behalf of some people. 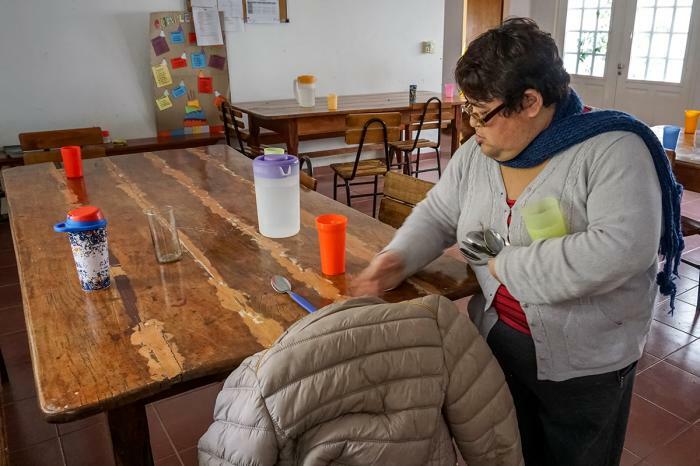 Sandra Cardozo, a regular at Fundacion IPNAâ s Centro de Dia, sets the table before a meal in the centerâ s dining hall. "We have five-month delays in the payments," Goldman says, adding that the center runs on user dues. "We have been able to keep up thanks to savings that the foundation had, but we donďż˝ t know for how much longer we will be able to continue." This problem spans the country. The government's sporadic funding is preventing people with disabilities '" more than 2 million people, according to a 2003 national survey '" from accessing the medical services, medication and rehabilitative care they need. Since December, the government has stopped making regular payments on behalf of people with Programa Federal Incluir Salud coverage , says Daniel Ramos, president of Consejo Argentino para la Inclusion de las Personas con Discapacidad (CAIDIS), a collection of local organizations focused on the rights of persons with disabilities. Service providers are buckling under the pressure, he says. "Transportation services were cut, some institutions closed, others don't accept new Incluir Salud users, others work with larger groups of kids in order to save on personnel," Ramos explains. "The quality of care deteriorates." The Fundacion IPNA center started the year accepting visitors even if their monthly payments were delayed, says Andrea Correnti, director of the center. It can take weeks for government to authorize and release payments, Correnti adds. "There are kids who have been inactive since the beginning of the year because Incluir Salud delays giving them authorization. We took them in anyway with the authorization in process," she says. But as the foundation's resources run low, this is no longer an option. Graciela Ferrari (left) regularly visits Centro de Dia, a center run by local nonprofit Fundacion IPNA. She has befriended Sonia Trabichet (center), a cook, and comes to the center with her mother, Beatriz Rueco (right). Laura Guerrero, the center's psychologist, fears the facility's closure. "We live with the fear of not knowing how long the institution and the labor pool will be sustained," she says. Center users are just as worried. Graciela Ferrari has been coming to the center for eight years. She says that she learned to cook, manage a garden and become self-sufficient through the activities available here. "If I can't come here anymore, what do I do?" she wonders. "For me, this is my life." Ferrari has cerebral palsy and needs regular doses of anticonvulsant medication and nutritional supplements. Since the end of last year, the state has not provided her with the drugs, which she used to receive regularly, free of charge, she says. Ferrari's mother, Beatriz Rueco, says her daughter needs the anticonvulsant medication and the supplements daily. Rueco now covers the cost for both: 190 pesos ($6.80) for the anticonvulsant medication and 460 pesos ($16.75) for the nutritional supplements, each month. Verdura, who has diabetes, faces a similar challenge. He needs glucose strips, the mainstay of blood-glucose testing. Without them, it's difficult to monitor and control his diabetes. "Before, they used to give them to me for free in the hospital," he says. "Now I can't get them." Its been six months since Verdura last received the testing strips from his local hospital. The halt in payments is a result of transitions between government agencies, says Pablo Atchabahian, national director of Programa Federal Incluir Salud. In March, Agencia Nacional de Discapacidad, the national agency in charge of the country's disabled population, took over the public health-insurance scheme from Ministerio de Salud, the ministry of health. Atchabahian says officials are working to ensure that payments resume for those with the insurance.